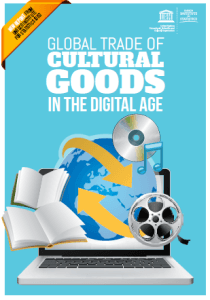 The trade of cultural goods doubled during the period 2004-2013 despite a global recession and a massive shift among consumers of movies and music towards web-based services. A new report from the UNESCO Institute for Statistics (UIS), The Globalisation of Cultural Trade: A Shift in Consumption–International flows of cultural goods and services 2004-2013, takes an in-depth look at the export and import of cultural goods and services around the world. Data and analysis presented in the report show that the international trade in cultural goods — an indication of the resilience of cultural industries — remains robust, despite a dip in 2008 during the global recession. China is now the lead exporter of cultural goods, followed by the United States. In 2013 the total value of China’s cultural exports was US$60.1 billion; more than double that of the United States at US$27.9 billion. While the U.S. has lost its position as the top exporter of cultural goods, it remains the top importer of these goods. In general, developed countries play a smaller role in cultural exports, but still dominate imports. Meanwhile, emerging markets are growing their exports of cultural goods. Turkey and India strengthened their position in recent years, joining the world’s top 10 exporters of cultural goods. Which products are gaining ground? Art and crafts have moved up in the ranking of the ten most traded cultural goods, fueled by gold jewelry — a safe harbour in uncertain times. Gold jewelry exports represented more than $US100 billion in 2013. China, the U.S. and India were the leading exporters of gold jewelry along with newcomers Malaysia, Thailand and Turkey. China alone earned US$32 billion from jewelry exports compared to US$10.3 billion for the United States in 2013. Statues, statuettes and paintings also gained ground. Their share of the trade in art and crafts was worth US$19 billion in 2013. China, the U.S. and the U.K. were the top exporters of these products, followed by India, Viet Nam and Indonesia. Which products are losing ground? From 2004 to 2013 the “dematerialisation”, or the digitisation of physical products, had an enormous impact on music, movies and newspapers as these products moved into the realm of cultural services, often sold as web-based subscriptions. Trade in recorded music products, for example, declined by 27 percent from 2004 to 2013, and trade in movies fell by 88 percent during the same period; however, audio-visual services as a whole steadily gained ground. Despite the downturn in the trade of print products, reflected by the decline in newspapers, books held their ground as an important cultural export in some regions, growing by 20 percent from 2004 to 2013. Besides creating jobs, exports of cultural goods contribute to the dynamism of local and national economies; however, the report notes that obtaining accurate data on the flow these goods is becoming more challenging in the digital age. Do we have to create new statistics or use different data sources? Finding new sources of data and cooperation between international organizations in the promotion and improvement of cultural trade statistics, especially in the developing world, will help improve the understanding of the real contribution of cultural trade to the global economy.